Kayak, Canoe and Tube Rentals Nearby. River Access for Fishing and Lounging. Great Room with Cathedral Ceilings and Gas Burning Fireplace. Flat Screen TV with Cable and Netflix. Wall of Windows to Enjoy the Lush Green Surroundings. Spacious Loft Bedroom with High Ceilings. 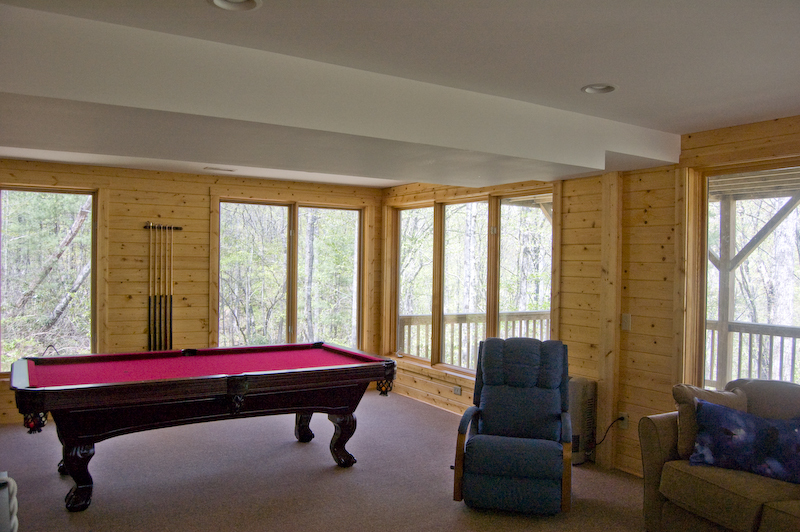 Lower Level Game Room with Pool Table and Access to the Lower Level Deck. Sitting Area in Media Room. Media Room, Satellite TV and Games. -	Tree-house views in summer - river views in winter! When you want a peaceful, rustic get-away, but you still expect the little touches of luxury you're accustomed to, you've found it with A Peace of the River. 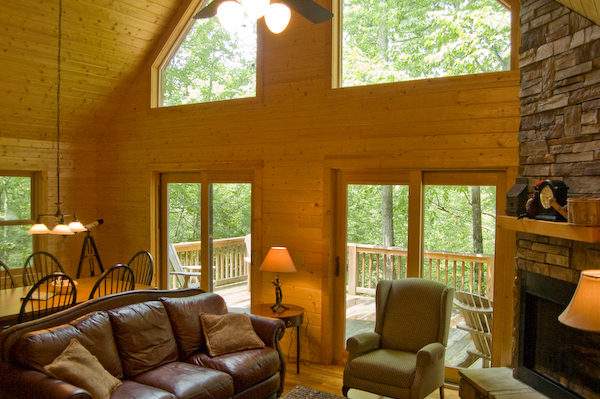 This comfy cabin offers peace and privacy in a lovely wooded setting, along with generous outdoor and indoor recreation space. The duo-level deck provides a luxurious hot-tub, as well as plenty of space and seating for entertainment and cook-outs, while enjoying the tranquility of the woods. 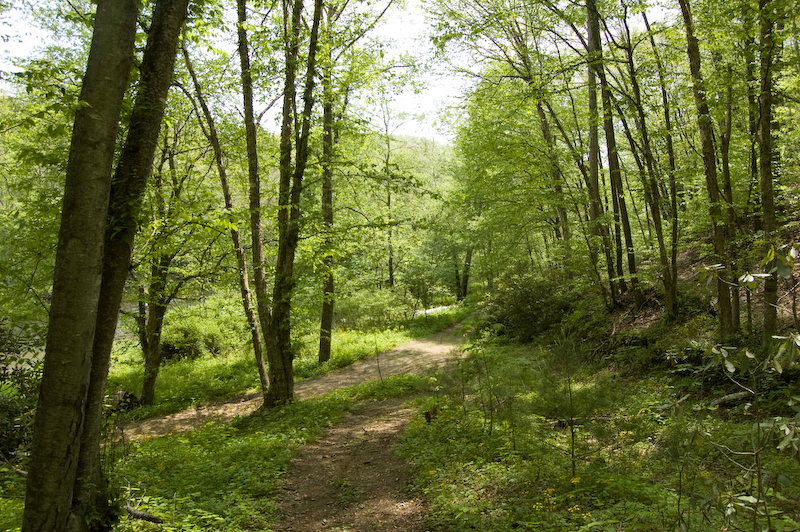 Take a peaceful hike down, through these woods and you'll quickly arrive at the New River - available to you for swimming, fishing or tubing. This home is in a wonderful central location, close to West Jefferson, Glendale Springs and only 30 minutes from Boone. The main level offers an inviting open floor plan with a spacious family room, dining area and homey kitchen, well-stocked with everything you need for a family dinner, including microwave, dishwasher, coffeemaker and plenty of dining accessories. A propane grill is also provided on the deck for your convenience. When dinner is done, snuggle by the cozy gas fireplace in the family room, or soak in the sparkling clean hot tub. 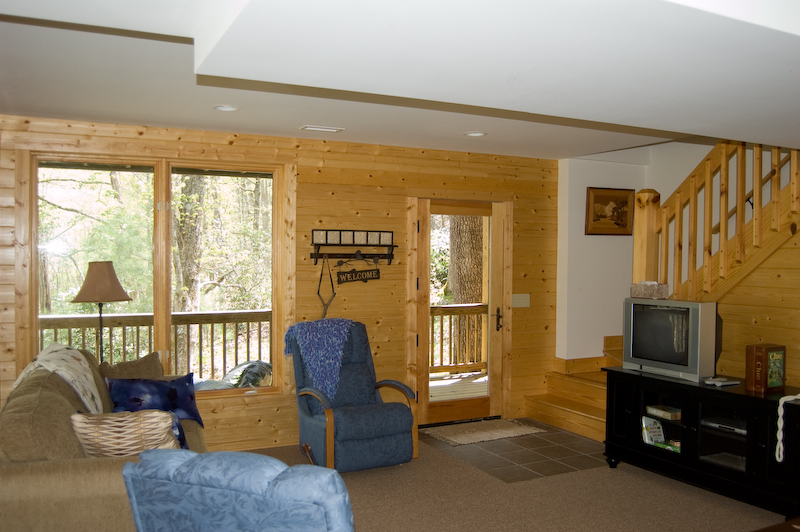 The family room also offers a flat-screen cable TV with DVD player. The oversized windows help you enjoy the lush green surroundings and seasonal river views. The roomy dining area opens to the wraparound deck. On this main level you'll also find a full bathroom and two bedrooms, one with a double bed, and the other with two twins. 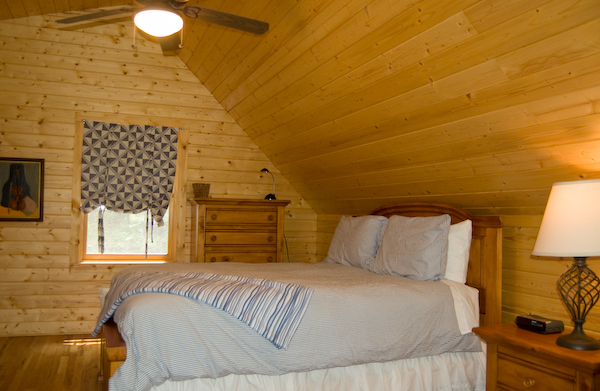 The master bedroom is located in the loft and offers a queen-size bed and full bathroom. You'll love the lower-level rec room with a regulation-size pool table, TV, DVD player, numerous board games and a dart board. This room also provides a queen-size sofa sleeper, to accommodate additional guests or children. This great family area has direct access to the lower deck with a porch swing. Note that due to the private, classic mountain setting, all-wheel or 4-wheel drive vehicles are recommended. The driveway is a bit steep. Parking is available at the top of the driveway. In the High Country, gorgeous scenery awaits you at every turn. In the quaint mountain town of West Jefferson you have restaurants and terrific shopping, including antique stores and art galleries. There's even a movie theater. This is small-town Americana at its finest. The gorgeous, 120-year-old Glendale Springs Inn is also very close and offers wonderful upscale dining. If you're dreaming of a snowy mountain winter, you've also come to the right place. Enjoy sledding, snowboarding, skating - and of course skiing - all winter long. Or watch the snow fall softly and serenely outside, while you're cozy in the cabin! Fall foliage is indescribably gorgeous. It's easy to entertain yourself for hours, such sitting in a rocking chair - or the hot tub - and gazing out at Nature's bounty. No matter when you visit, A Peace of the River will help you melt the stress of the city away! We welcome well behaved, furry friends. $50 / Dog Fee. Sorry Cats not Permitted. "We loved our stay here! 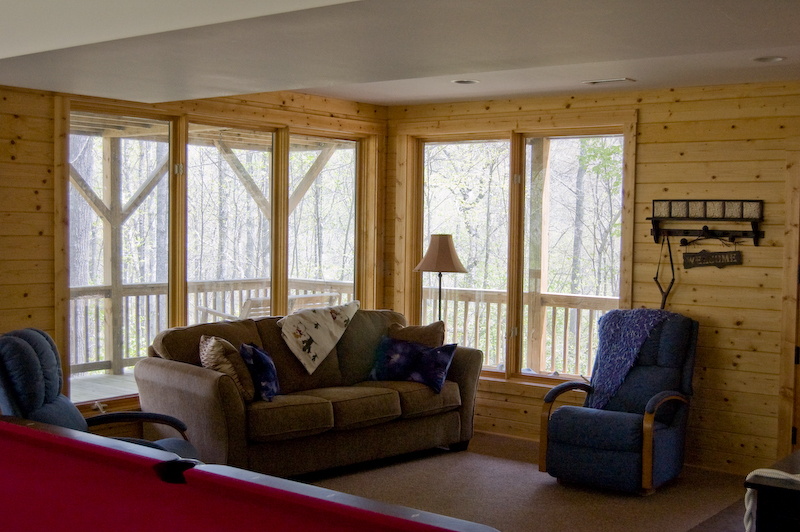 Cabin location is as best as it could be, from the Patio deck all you can see is woods and be one with the nature. Hot Tub location cannot get better either. Would definitely revisit the location, I recommend this to anyone looking for stay in wood and hike the blue ridge parkway." "We had a short stay Thursday - Sunday. 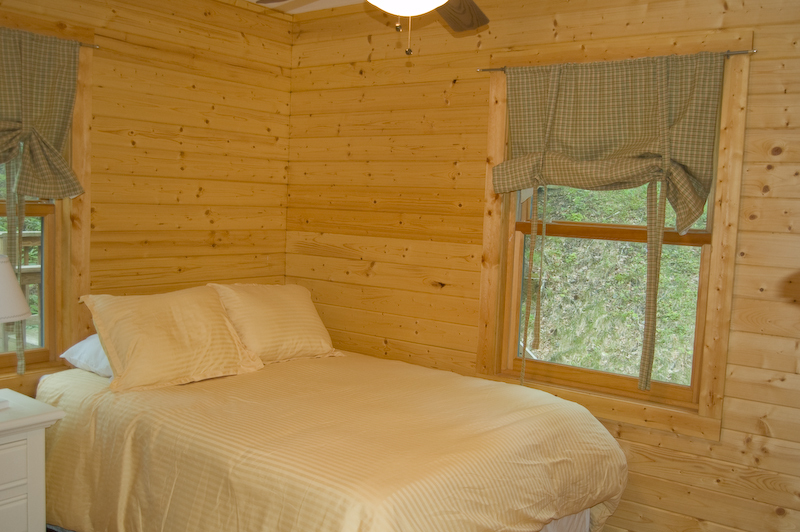 The Cabin is spacious inside and comfortable. 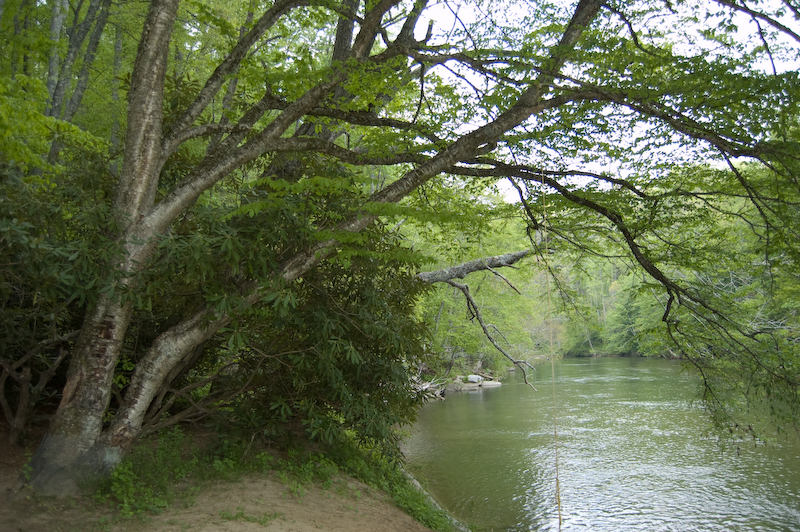 Outside the decks are shaded by trees and the river is a short hike down a well beaten path. We floated the river. The first day floating from upstream to the cabin access, the second day, from the cabin access about three miles down stream. Both floats were relaxing with beautiful scenery. Finding access to the river upstream is slightly difficult although we found a kind river front property owner willing to allow us to launch from their property. Floating from the cabin down stream was easier with access out of the river at the Methodist church camp. The house provide a wonderful short vacation accommodation. " "We absolutely loved the house and plan to stay there again.The house was beautiful and we never saw anyone was a very nice relaxing getaway.Plus the hot tub was wonderful.The only problem was the was so worn out that my husband was afraid it was going to fall apart while he was using it.But that was the only issue we had there.We were very satisfied!" "I was pleased with this property a few things needed to be fixed I feel like upon my arrival the toilet in the main level bathroom had to lift handle every time you used or it would not stop running and the down stairs had places spilled in the carpet that were there when I arrived! Also called on Thursday about a key that was not left on table and never was brought a extra key but overall it was a great property "
"Loved this place,cant wait to go back "
"One of the best cabins we have stayed in ! Few things need to be updated/upgraded. Overall~ very pleased. " "The Best Weekend in a LONG time.. We all had the best time!! Thank you!!!" "I would definitely recommend booking this cabin! The location is perfect because it feels secluded but you are only 10-15 minutes away from the grocery store, restaurants, and shops! We loved the deck! It is able to be closed off so we could keep the doors open to get a breeze while allowing our dogs to roam around the deck and not escape! We had 3 couples stay here as an escape from the hurricane and none of us wanted to leave! The management company was very helpful with booking us last minute! We will definitely be booking this cabin again! " "We went up for my sister's bachelorette. It was a great house with a nicely stocked kitchen. I love that the river and lovely trails are nearby so we never had to drive anywhere. beautiful weekend getaway. " "Very comfortable home. End of the block and very private." "We had a great time and the cabin was everything we needed. The peace and quiet was great and it was a very relaxing weekend." "Overall the house was very nice and clean. We enjoyed coffee on the deck in the morning and playing pool/ping pong in the evenings. The trails around the house were nice but unfortunately very messy due to recent rains. My biggest complaint is the location of the house in relation to the river. Think the location would better be described as river view instead of river front. It is quite the haul to the river and not easily accessible once you get there. Couldn't even hear the river from the lovely deck. If the river isn't in your plans, the setting in the woods is nice. Lots of birds to enjoy. " "It was just wonderful. My husband and I wanted to get away for the weekend. Our birthdays are 1 week apart so we decided to treat each other to this "cabin" as our gifts to each other. We were floored by the "cabin". It is absolutely beautiful! Far above our expectations. The whole house is just lovely. Our only complaint is that the path to the river was pretty rugged. We had a hard time getting there and back. The clearing was not sufficient for a fishing spot which is his favorite thing to do on vacation. It would be nice if you could invest in making the path a bit more accessible and some sort of pier or step down access to the river. Our expectation from the photos was that we could walk out the back door and be right on the river which is not the case. We still had the best time so it did not deter anything. We just wanted to make that suggestion to the owners of the property for future visits...which we hope will be many! " "We had a great stay at this rental. The location was convenient to West Jefferson and we enjoyed being close to the river. Six of us stayed there comfortably and there was room for two more on the pullout couch in the basement. Had fun using the ping pong and pool table. We had a minor inconvenience when the hot tub wasn't functioning correctly, but after contacting the property manager a technician fixed it the same day. Felt like the manager was very attentive to our needs, and she scheduled the technician to come while we were in town on a Sunday. Overall we had a great time - my wife was happy and thus I would definitely stay here again." "Great Getaway ,secluded with short walk to the river. Everything in great working condition. VERY Comfortable beds- THE BEST! Just remember- BRING THESE as they are NOT supplied- paper towels, napkins TOILET PAPER and trash bags( more than 2 bags left = you haul your own trash away! )and laundry detergent. Would visit again and enjoyed the stay!" Thank you for the wonderful review. Future guests, please not per the check in instructions we only offer a starter supply of paper products, trash bags and laundry detergent. "Lovely and relaxing. The home has a nice trail to walk along the river. 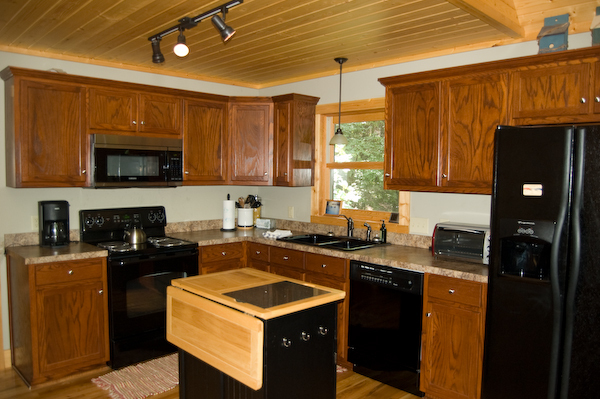 The Cabin was very clean and had all of the cooking amenities I needed to cook my heart out. " 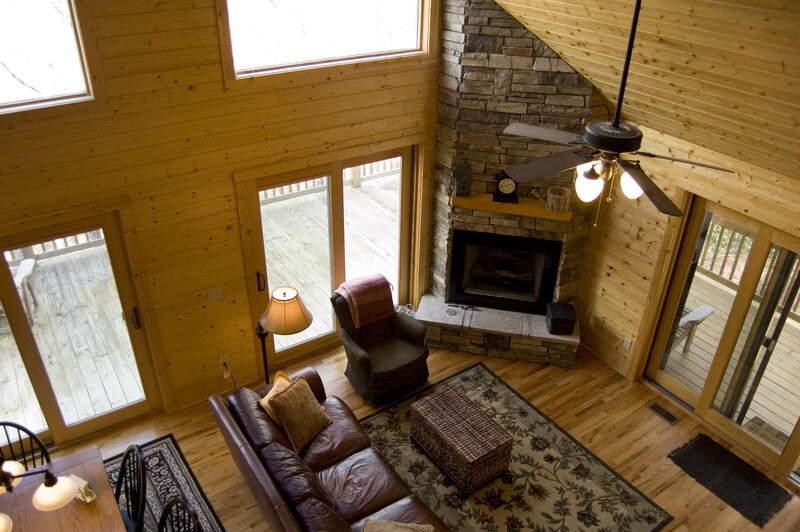 "My husband and I rented the cabin for a weekend getaway and it was the perfect house to rent. We brought our 1 1/2 year old and the house was very kid friendly. They had kids cups in the cabinet and baby gates to use. The outside balcony had a gate you could close so we didn't have to worry about him wondering of the deck and could enjoy the scenery without constantly watching him. The house was nice and cozy with a great fireplace. We enjoyed the hot tub and pool table and walking along the river. My only negative was that the loft area gets extremely warm with the fireplace on that's downstairs and does not ventilate well. This is a great place for a couples getaway or for families!" Thank you for your response. We are happy that you and your family was able to enjoy the weekend. Thank you for staying with us and we look forward to seeing you again! "Another beautiful trip to the High Country of North Carolina. Our accommodations exceeded all of our expectations. Minor suggestion: New cues for the pool table." Thank you for your response. We are happy that you enjoyed your stay! We appreciate your suggestion and we are working on this. Thank you for staying with us and we hope to see you back soon! "Thank you for a great and relaxing time away.. the books and games were very appreciated.. everything was very clean and comfortable.. well done!! Bg "
Thank you for your response. We are happy that you enjoyed your relaxing get away. Thank you again for staying with us! We hope to see you back soon! "Having rented cabins in the mountains, thought we give river frontage a try. Having a five year old granddaughter with us, this presented plenty of exploration options. Plenty to keep busy here from hiking to river play to ping pong. This offers all without having to get in a car and drive to destination. Home was comfortable and clean. Could only imagine how spectacular fall foliage would be here, especially from comfort of hot tub." Thank you for your review. We are happy that you and your family kept busy and enjoyed the hiking and the river. It's nice to "get away from it all" and it sounds like you did just that! Fall colors are amazing and visitors can find pumpkin patches and corn maze to enjoy. We hope to see you soon! 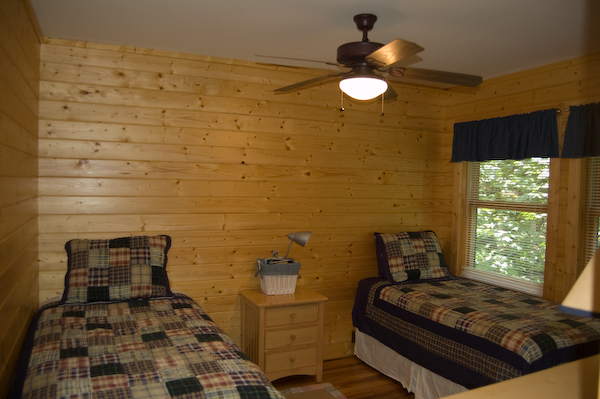 "The cabin was great, my family of 5 enjoyed the stay. The fact that we could walk right down the path and play in the New River was wonderful. The town of West Jefferson was close enough for quick convenient trips. The area has a lot to offer if you are willing to drive. The only real issue was garbage disposal we had to drive over a half hour to the transfer station. Better directions or an accurate map of dump locations would be helpful." 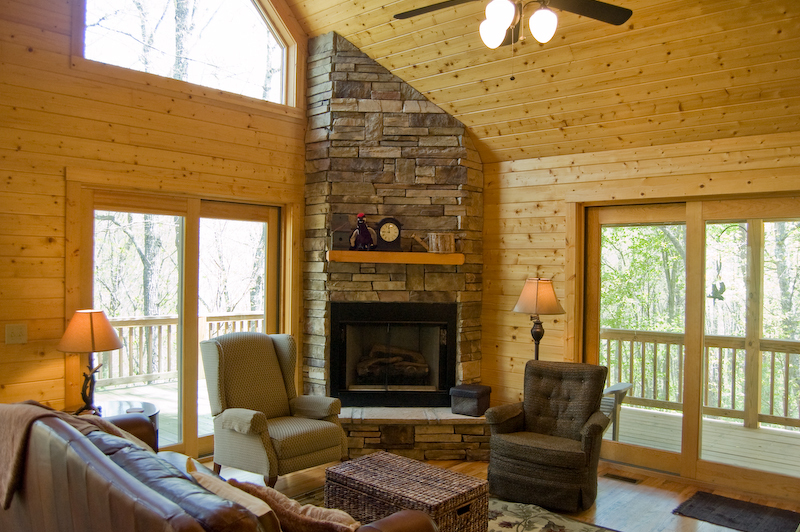 "This cabin/vacation is just what our family needed, our last before our daughter's wedding. If you need to get away from your busy life, this is the place for you. The property was very peaceful, quite and nestled in the woods. Even though it rained our last day, everyone had numerous options for inside entertainment. The t.v. was only turned on for an hour the entire trip. I do have to point out two negatives. One, the driveway is difficult and needs some work. Two, is the trail to the river. The river is visible from the cabin. 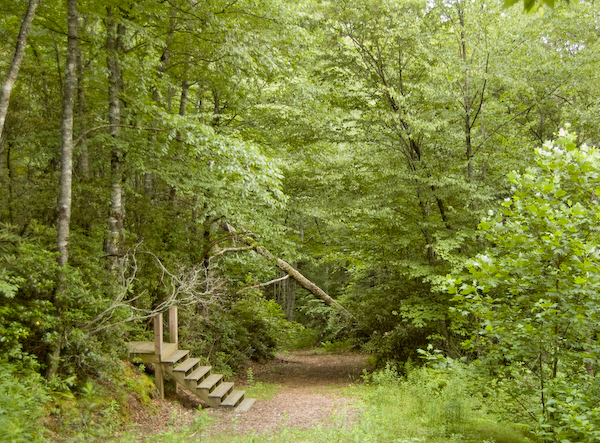 However, to get there you have to HIKE a long trail. It would be nice if there was easier access." "Our experience was great. We have stayed here several times and love it." "We were very please with the house and well as the location! We will def stay here again :) "
"Our group (including pets!) had a great time here. The cabin is seated right above the river and although there are neighbors, they're far enough away to give you some privacy. We had no disturbances during our visit, the kids loved the pool and ping pong tables, and the adults loved the hot tub. Just a short drive to West Jefferson, Boone, Blowing Rock, you name it." "The cabin is nice, basic necessities are provided, but not much extra. TV is tiny and only basic channels avalible, which was disappointing when its cold and late and just want to cuddle up to a movie. Hot tub was a nice touch, relaxing and somewhat scheduled in the woods. Love the location and scenery. The cabin just felt like a renatl property not much effory made to make it feel as homey as ones i have stayed in the past. The grill has been upgraded since past reviews which was also a nice touch. The outside enviorment and river view is very pretty. I enjoyed the stay overall. " "We enjoyed our stay and would stay here again. " "The home was very well set up for our needs. The hot tub and pool table were great." "my sister, my 2 nephews and myself had a great time. Loved the house. It is really a great place to go to get away from the city life. Beds are comfy, nice pool table, great hot tub, and fully stocked kitchen (cookware and utensils). Driveway is steep but my little civic made it up just fine. " "We have stayed in this house twice and we love it. We plan to go back again.The only negative is the steep, gravel drive. It can sometimes be hard to get out so we park at the top of the drive and walk 's maybe 50 yards if that. This house is well worth the stay no matter the driveway." "Home was well maintained and comfortable with a great view of the river. Hot tub was in great condition and very relaxing. The downstairs rec area with pool/ping pong table was a great fill in activioty between fishing and hiking." "it was a great time, great house"
"This is a really nice property. Location convenient to West Jefferson. Quite a few homes around but seemed isolated. Beautiful building, appliances good, great views, very quiet. 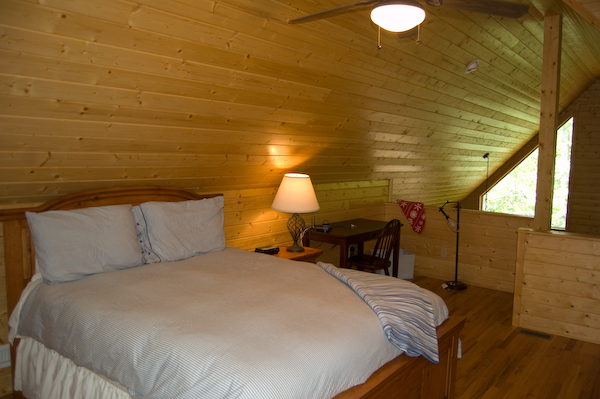 Only drawbacks were the driveway is really steep and the master bedroom is open loft so noise travels inside cabin. Overall excellent." "A Peace of the River provides a quite and peaceful retreat. The cabin is very nice and well maintained. Although the furniture could be upgraded, this would not prevent us from staying there again. The location is convenient to all local attractions and shopping. Great mountain retreat." "Although we have lots of experience renting for ourselves and being landlords,this was our first experience renting a cabin for a family weekend with grown children and grandchild. The cabin was cozy, clean, and convenient to hiking along the river. It was a beautiful, quiet, private place and suited our needs quite well. We did have a little trouble getting back up the hill out of the driveway since we did not have a four-wheel drive vehicle. I have never seen so many rules and extra potential fees that could be charged!" "Amazing time! Loved the house. Much better than expected. Kids had so much fun in hot tub and playing pool. Only thing that would have made perfect wound be river access. Walk was fine to river but no easy way to put in tubes or swim. Otherwise it was a great weekend "
"it was fantastic, as always. " "Simply put we will be back"
"This cabin has been our vacation spot for the last few years. It's been perfect for our family of four (kids middle school to high school age. The cabin is beautiful and spacious. The setting is lovely. You can see, hear, and easily walk to the river. 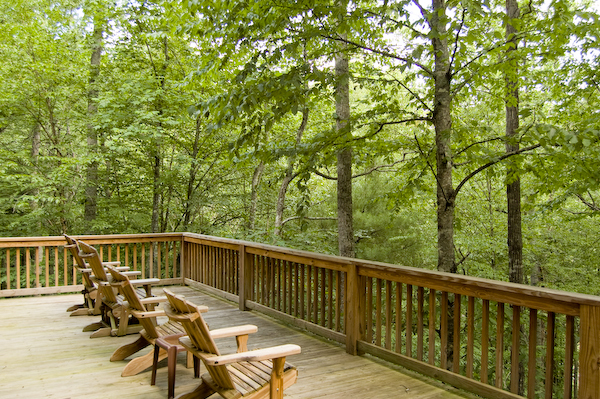 We especially enjoy sitting out on the upper deck, surrounded by the tree tops. The hot tub has been a nice addition. With the pool table, cable TV, books and Wi-Fi there's plenty to do inside on rainy days. There's plenty of daily activities and all you might need in the way of retail within a short drive. We plan to go back again. The property description was accurate. We found it originally online and have been pleasantly surprised that it was even nicer than we expected. The property was clean and well-maintained. The property manager Jerrita Roark, has always been helpful and easy to work with. We have recommended this rental to friends and relatives. West Jefferson and the surrounding area has good restaurants, art galleries, and fun vacation retail outlets. Tubing, kayaking etc available and user-friendly. The church frescoes, the Blue Ridge Parkway and driving anywhere in the countryside all relaxing and interesting." Thanks Bean Family - we love having you stay each year! "Very peaceful and quiet. Close to town...yet far away from the sounds of city life. We have stayed at several of the homes Ashe County High Country has to offer and have never been disappointed. " "Loved it will book again. My 7 year old and I fished the river every morning and caught fish every day. The only complaints we have is the kitchen lighting was very poor and hot water heater is dangerously hot. " "This was a great place for a ladies weekend getaway. " "We've been here a couple of times and enjoyed it each time. Lots of space and it feels isolated despite the neighbors pretty close by. Clean and fairly modern amenities. The hot tub is a nice addition!" "Great location, wonderful fishing and paddling!" "Wonderful cabin. Great family Thanksgiving experience." "My husband and I wanted to get away for the weekend and A Peace of River was exactly what we needed. It was private and very peaceful. Will be going back soon." "The cabin was everything we hoped it would be. Very clean and comfortable. We did have to call in regarding the fireplace. We could not get it to come on the afternoon we arrived. Maintenance promptly came the next morning and fixed the problem. The river was a bit difficult to get to and there is a hill that you go down to get to the cabin. Going down was fine but we did have problems going back up but we did make it! With that we still would definitely stay there again and hope to go back next year. " "The rental was wonderful. It felt like home. A well-outfitted kitchen, comfortable sleeping accommodations, with large windows looking out onto a canopy of trees running down to the New River. The living room/dining room was relaxed and perfect for watching TV or playing board games. Downstairs is a full size pool table which can be converted for ping pong. We were about 15 minutes from Zaloo's Canoes where you can canoe or kayak down the New River. We'll likely visit the area again and stay at the same place." "This home is much better than it looks in the picture. It is located in the woods. It is like a tree house. You can barely see the River but it is nice walk down the hill on a path. The home using blonde wood finishes to keep it from being dark inside. Beds are Serta Perfect Sleepers and we found them to be great. There was even a coffee grinder. But the best thing was the large railed porch outside has a gate so you kids or your dog can stay out here and not run off. You are in the woods, so yes a bug might come in the window or door, so get over it. The Pool Table was better for my family than a heated pool. Lots of woods around and very few homes. You don't feel like you are right next to people, but not totally isolated." "Great place to get away, hope to come back for longer stay. Could use street numbers to ID the location." 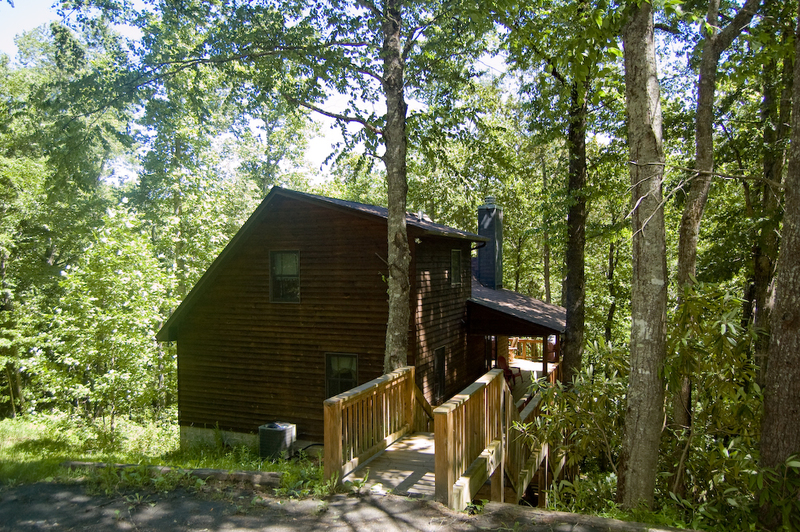 "We had such a great time in Ashe County and the cabin was perfect. Clean and comfortable yes, enjoyed the deck in all times of the day. Due to the rain, we were not able to sit along on banks of the river. We found plenty to do in the area including The Virginia Creeper Trail, Greyson Highland as well as the lovely town of West Jefferson. " "We had such a great time this weekend! The cabin was very clean and in a great location. Loved being on the porch an listening to the river flow. We tried our hand at fishing, but with the recent rainfall the river was too muddy and swift. Hopefully next time we will have better luck. We hope to stay a week next time! " "First time my family & dog stayed at cabin by ourselves without other families. We enjoyed the trail down to the river and the sandy little island look it had. Awesome cabin and everything we needed for cooking. The snow coming down at night was a spectacular view from the large windows. Beds were all comfy and cozy at night. Large game room down stairs kept my teenagers entertained thru the weekend stay. Loved the gate on the upper deck as well for keeping my little beagle inside while we cooked on the grill. Although the lower deck porch and spot light bulbs were blown and it was total darkness the first night until we went to town the next day and picked up some bulbs. We didn't mind at all though, just needed more light going out at night with our pet. Some of the games were in bad shape and a little roughed up, but kids stuck with the ping pong & shooting pool. Overall stay was absolutely wonderful and pleasant! 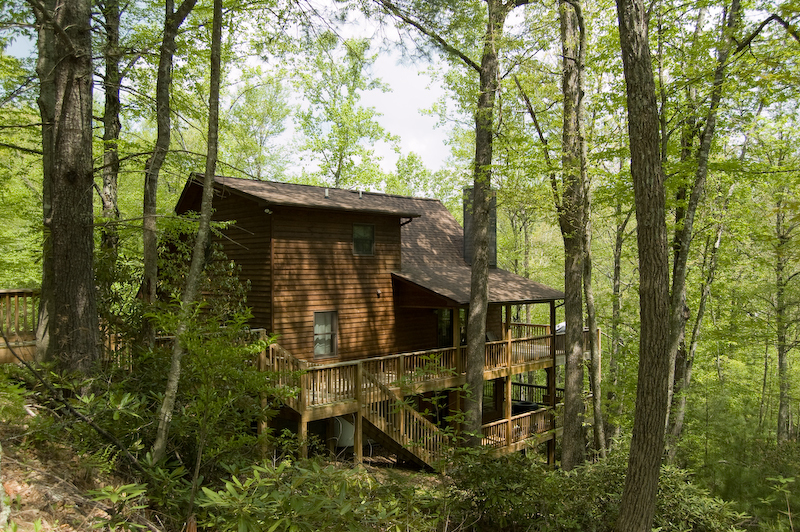 Our family plan to come back and spend a week during the warmer months at this same cabin and enjoy fishing and trails. Maybe bring two extra people with us because we had plenty of room. Wouldn't change anything about this cabin. Maybe just add some curtains or blinds in the downstairs game room for more privacy if someone wanted to sleep on the sleeper sofa. Adding a hot tub and a large screen tv would be super nice as well. :) But we still enjoyed every minute during our stay in the cabin anyway. It was a very nice getaway after my daughter's last chemo. Kind of a special celebration for us all. We needed this and will need it again I'm sure! Thank you Ashe High County Rentals for this great stay! We have been blessed." "We loved the cabin. It was nicer than the pictures revealed.. Can't wait to go back." "We recently stayed at A Piece of the River for the second time. Need I say more? We love this rental. The location so peaceful and quiet. The house is beautifully decorated and clean and we had so much fun shooting pool and sitting on the deck listening to the New River. I feel sure we will rent this house again next year!" "The property was just wonderful. Clean is very important to me and this was an A+. We will be returning." "We were pleasantly surprised about the condition of the house and definitely want to stay here again." "A Peace of the River was everything we hoped for and more. We really enjoyed the deck and all the furnishings and PEACE and quiet afforded there. The only thing to be improved are the mattresses...I will definately give a 5 star rating for everything else!!" "Very pleasant stay. Loved the trails by the house and how close to the river it was. We loved how it felt like a home away from home. Will defently book again." "On a hillside above the New River. Very quiet and peaceful. Compact but comfortable cabin within easy drive of West Jefferson. Intermittent cell service due to hillside location." "Nice, well maintained log cabin. It has a open floor plan. It does have a steep gravel driveway going down to the cabin. Plenty of room with 8 family members and our dog. Only things I would add would be a dish rack to dry dishes, automatic ice dispenser (cabin has ice trays) and a set of bunk beds. There is plenty of room in the basement to add a set in the back corner. There is a full bath on each floor. Sheets & towels included. 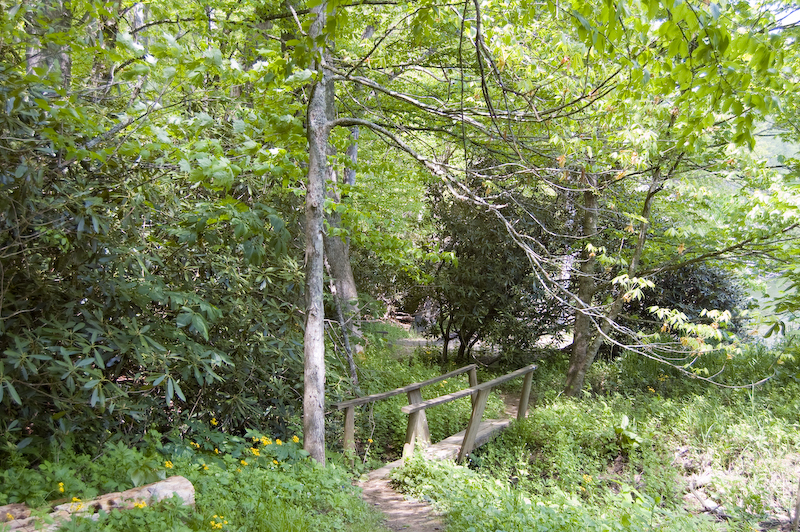 The trail to the river is a great way to get some exercise. We had a great time! Enjoyed the cabin. Note to fishermen, this section of the river is not stocked. " Creeks, streams and smaller sections of the New River are stocked. 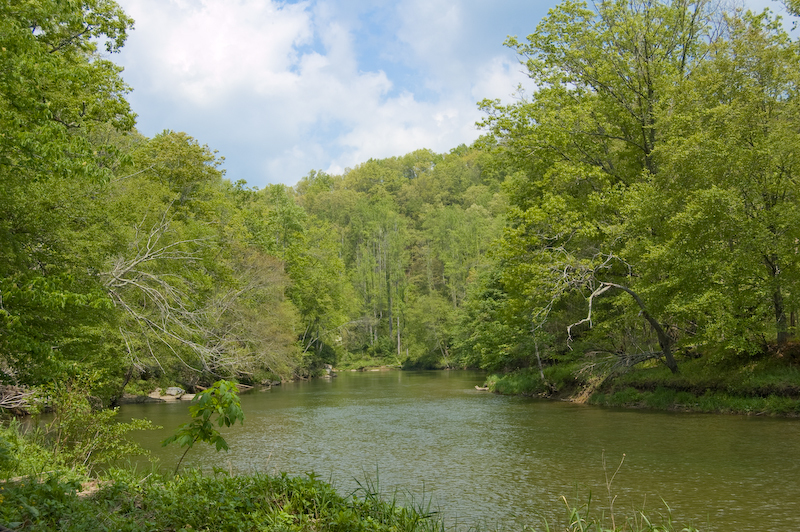 This area is native fishing and the New River boasts some of the best small mouth bass fishing in this area! "Six of us came and had a great stay. Well maintained and clean. Definitely would come back." "We had a great time at the cabin, 7 days of trails and the river! The cabin was awesome and had something for everyone in our group of 7. Plenty of restaurants in West Jefferson and we were very close to the parkway too." "We love the house and the location. We can't wait to go back. " "Overall the property was very clean and in excellent condition. The lighting in the kitchen area could have been better and the matress in the sleeper sofa in the game room was in poor shape. These issues would not prevent us from either staying in this cabin again or recommending itto ur friends." in our truck with luggage and family. Maybe the staff could reconsider this request. Other than that we had a great time and will return next year for sure. " 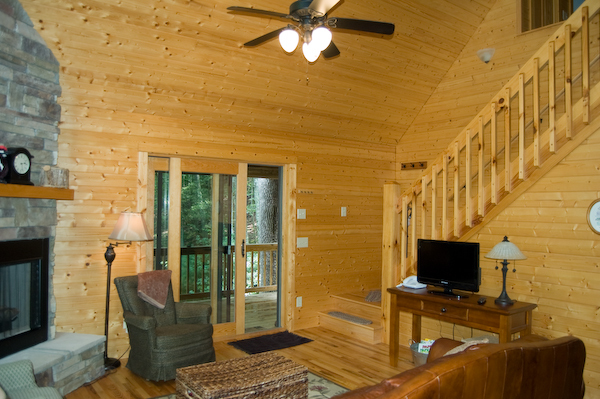 "The cabin was very nice, and we particularly enjoyed the gated covered deck, and the leather couch. Our teenage children enjoyed the pool table/ping pong table and the internet access. The cabin wasn't quite as clean as we would have liked. There was nothing glaring, but there was food stuck to the inside of the sink that someone missed when cleaning, and a few other cleaning things that probably only I would notice, having owned a commercial cleaning business in the past. The wooded/river setting was nice and the cabin was convenient to Lowe's Foods, Walmart, and restaurants. If you are bringing a family, bring extra toilet paper and paper towels. I was glad we brought our own bath cloths and towels, so that we had enough of those. Having a washer/dryer was convenient, so as not to have to bring home lots of laundry. Overall, we really enjoyed our visit to to the West Jefferson and Boone area." "We usually go to the coast for vacation but decided to try the mountains this year and had a wonderful time. Everyone pouted when we had to leave! The house is in a very private location, sits on a hill with a view of the river (through the trees). It was extremely clean and the decor is beautiful. It rained almost every day when we were there but part of the upper deck is covered and we sat out on the deck and read and looked at the beautiful scenery. We also had so much fun playing pool and ping pong. The only negative thing I could say is that the gas grill is in poor condition. We didn't use it but cooked inside instead. There are lots of neat shops and restaurants in West Jefferson and Jefferson. We had planned to eat out a lot but ended up not wanting to leave the house! What a great time we had!" about that that the porch was fully of dried leaves that we had to sweep up and the grill is not in very good condition. house was only two and a half hours and was a nice relaxing ride on 421." "A Peace of the River is beautifully appointed. The kitchen had everything we wanted. The selection of games and the pool table were wonderful. We spent hours on the deck reading and looking at the river. Zaloos Canoes and the Blue Ridge Parkway are close by for when we did venture out. The walk to the river is no problem. 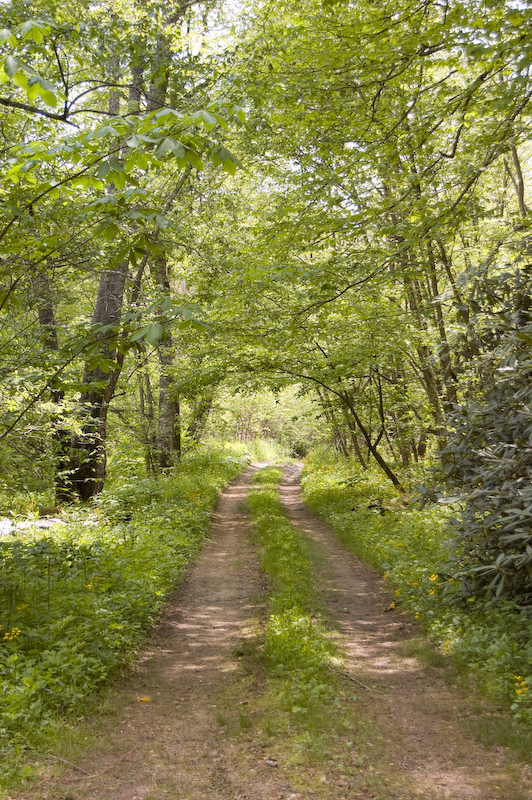 The driveway to the cabin is a bit steep, but with our regular suv, we didn't have difficulty." "The ONLY thing I would change is to have a deck BESIDE the river! (know that is not possible (flooding, etc). The view from the deck is great (though a couple of trees could be cut to make the view better!) We LOVED staying there and plan to get back VERY soon!! Thanks!" "The best part of the experience was the wonderful help I received from the people at Ashe High Country Vacations. Everyone I spoe with was extremely friendly, helpful and courteous. " "The cabin was beautiful and furnished with nice furniture and comfortable bedding.The kitchen was well equipped for all your cooking needs.The balcony was large and had a nice view of the river while feeling like you were in the treetops.The property manager was very helpful and instructions were clear as to the expectations of the renter.We loved the cabin and property and will definitely stay there again.The only negative thing was having to leave!!" "This property was just what I had in mind after reviewing the website. I was in need of a couple of days of relaxation, and this was the perfect place! My children thoroughly enjoyed the basement and all the games available, and I thoroughly enjoyed sitting on the deck listening the river run down below. It was also very nice to have grocery stores and conveniences only 10 mins. away! We will definitely stay here again!" ""Peace of the River" was just what we were looking for. The best part is a giant deck looking through the trees on the New River. There is small rapid and the distint sound of water on the smooth rocks was very relaxing. The set up of the rooms made for a good measure of privicy for five adults and the place seemed brand new. Very clean with comfortable beds and furniture. We also had fun walking down to the river and across a few trails. And one of the best aspects is the vicinity to West Jefferson. We excellent food, art, music, and friendly people, this is a destination. The road to the cabin is a little rough so would recommend a vehicle that can handle climbing and decending; I am glad I wasn't stuck with a rental compact at the airport. However, the cabin was perfect in every other way including the price "